As stated in Build and handling, Nikon has released a new retractable kit lens to partner the D3300. 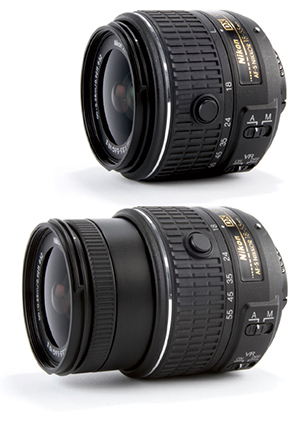 The AF-S DX Nikkor 18-55mm f/3.5-5.6G VR II lens consists of 11 elements in eight groups, including one aspherical lens element, and has a minimum focus distance of 28cm in AF mode, or 25cm when manually focusing. It has seven rounded aperture blades, and a minimum aperture of f/22-36. The centre sharpness of the lens is surprisingly good, being on a par with the Sigma 105mm f/2.8 Macro lens that we use to photograph our resolution chart. At the edges there is some drop-off in sharpness, although it is acceptable and certainly not as bad as many of the kit lenses we have seen in the past. There are some signs of purple fringing in high-contrast edges towards the corners of the image, although it is reduced in JPEG images. It is also easily reduced in raw files. Despite clearly being built to a price point, the lens also includes Vibration Reduction image stabilisation. Overall, it is a good kit lens for those just starting out.